Astronauts and divers are both weightless, they both carry your own life-support with them, and if they screw anything up, they both can easily die. After having my own close-call playing chicken with the scuba gods, and paying the price with 4 visits to the Hyperbaric chamber, I took a year off and read every single book I could possibly read on scuba diving, diving accidents, and the practices of the very best divers. So I’m going to share with you what I’ve distilled from my personal experience, and my studies. First, let me set the record straight: millions of people scuba dive each year without incident. Second, I’d like to point out that scuba diving, while presenting some dangers, is well worth the small risk, and has entirely changed travelling and vacationing for me. When you travel, you generally go to another city. Perhaps another state… And if you’re really lucky, you go to another country. But when you dive, you go to another WORLD. My experience in Thailand was perhaps the most striking in my life… after taking a 20 minute boat-ride to what (from the surface) just looked like an empty expanse of water, we plunged into the ocean… Dropping down a mere 30 feet, we entered a colorful world of moving, flowing life… With so much coral and so many brightly colored fish, it looked as if Dr. Seuss had dropped acid and gone to town painting beneath the sea. If you haven’t been scuba diving, especially in the tropics, I highly recommend it. Many people know that what you see when you dive is stunningly beautiful. 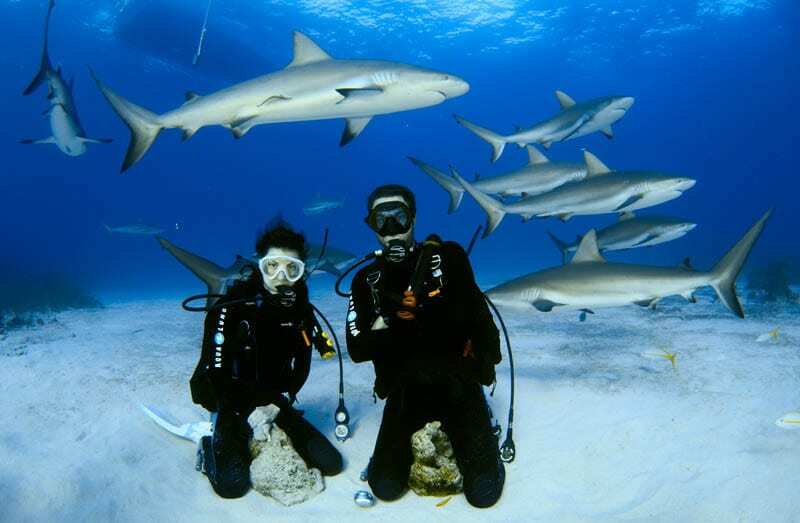 However, what most people don’t realize is that diving, when done right, is very relaxing. Proper diving technique is all about conserving your air… And that means you breathe constantly and slowly… and you ‘fin’ (kick with your fins) slowly as well. The more you dive, the less you swim… The less you swim, the more you see. When I dive, I am always in awe of the vast amount of life that is hidden beneath the desert-like surface of the ocean… I feel very alive. But I am also aware that it is very easy to be not alive if you don’t pay attention to some very important rules. You see, it is very easy to die diving, as my girlfriend and I found out… And it all goes back to one thing: AIR. Your air wasn’t turned on and you plunged into the ocean. Yes… Darwin is alive and well in the sea as well as on land, and every year, there are a few poor souls who forget to turn their air on, and don’t bother to have anyone check them out. That’s why the first rule of diving is very important: always have a buddy, and always have that buddy check out your air and your equipment BEFORE you go jumping into the ocean. Prior to jumping in the ocean, you should also put air into your B.C.D. (Buoyancy Control Device), which is essentially an inflatable vest that you use to stay neutrally buoyant under water… This keeps you from sinking like a rock when you first jump in… The sinking like a rock, especially when combined with a tank valve turned off, means can’t to breathe OR inflate… Resulting in what I like to call SAS or “Sudden Anchor Syndrome,” not good. You ran out of air. Unlike in everyday life, being absent-minded or seriously ADD is not a good thing in the hydro-world. Forgetting to check your air and leave enough for your return to the surface can result in more saltwater-on-lung action than most people can take. It’s very important to check your air often. You couldn’t get to the surface. This is why it is VERY important that, until you’re very skilled, you don’t go into caves, wrecked ships, or other “overhead” environments. These are places where you can’t return directly up to the surface if there is a problem. The vast majority of diving deaths take place among wreck divers and cave divers, for this very reason. If you become entangled or disoriented, have a problem with your equipment or physical disturbance, you have a limited clock to right the situation before your air runs out. An overhead environment adds one more obstacle to your ability to get to the surface. So, until you’re skilled at diving, it’s best to always be able to see a clear path to the surface. ALSO, there’s an added danger to these ‘enclosed’ environments, which is that their sheltered nature causes fine layers of silt to build up over time. This silt is like dust, and disturbing this fine dust can result in blinding clouds that make it impossible to find your way back out of what seemed like an easy-to-navigate environment. Too Much Air:Yes you read right. Air is great, but too much air is NOT so great. Just ask a popped balloon. You see, when you dive, the only way you can breathe comfortably at depths of 30, 80 or over 100 feet is because the tanks of air you use are highly pressurized…The “regulator” that you breathe from is designed to give you air at just the right pressure for the depth you’re at.To understand how the pressure that water exerts on you works, let’s use the example of the balloon… A balloon filled with air at the surface of the water, and then taken to 30 feet of depth, is compressed by the pressure of the water above it. At 30 feet (2 atmospheres), there is still the same amount of air in the balloon, but it is compressed to 1/2 the volume it had at the surface. At 60 feet (3 atmospheres), it looses another half of its volume, making it 1/4 of its original volume… (1/2 of 1/2 = 1/4). At 90 feet, it is 1/8, and so on. Every 30 feet, the volume is cut in half from the previous 30 feet of depth. Thus, at 30 feet, the pressurized air and scuba regulator feeds you enough air to fill your lungs at 30 feet, which is twice what it would take at the surface. What that means is that, if you took a full breath of air, and then raised up 30 feet, by the time you got the surface, you’d look like a puffer-fish, and your lungs would have inflated to twice their normal filled size. Well… no, actually that’s wrong. They’d have simply exploded, just like a balloon that got too much air. And that’s what happens if you hold your breath while diving.Unlike a balloon, it takes very little to over-inflate your lungs. And if you notice the math above, the largest volume changes take place in the shallowest water… So holding your breath as you ascend near the surface is a sure recipe for disaster. In just 3-5 feet, you can cause enough damage to seriously injure or kill yourself…And thus we have the next immutable law of scuba diving: NEVER HOLD YOUR BREATH. Always Breathe. The simple act of very slowly, lightly breathing keeps the passageway between your lungs and your mouth open, so if you start ascending too fast and that air in your lungs starts to expand, it has a pathway out of your body that doesn’t involve exploding your lungs. The wrong kind of air. There’s another danger that comes from underwater breathing. You see the air we breathe at the surface of the Earth is only 21% Oxygen… the remainder is mostly Nitrogen… to the tune of about 79%. Nitrogen is the same stuff as laughing gas at the dentist’s office. At the surface of the earth, the nitrogen isn’t absorbed by your lungs, as the molecules are too large to pass through the lung membranes, and as a result its not absorbed into your lungs. However, at depth, the nitrogen is able to be absorbed. As mentioned earlier, the deeper you go, the higher the volume of air that is pumped into your lungs, so that, at deeper depths, higher quantities of nitrogen start to enter your bloodstream. At very deep depths, you can get ‘narced’, or nitrogen narcosis. This is that goofy state you get in from the laughing gas… and it can be deadly simply because you start making really bad decisions, like ignoring your rapidly depleting air, or putting your regulator onto a lobster.The other danger of nitrogen is that, once it’s been dissolved into your blood, it must be released back out of your system slowly. Think of a bottle of soda… If you slowly open the cap, the C02 releases slowly and almost no bubbles are formed in the soda. However, if you remove the cap quickly, the whole bottle is in danger of foaming up and leaking out.The same basic principle applies with the nitrogen dissolved into your blood… You want to ascend to the surface slowly to keep bubbles from forming in your blood stream. There is a safe depth where the nitrogen can leave your blood via your lungs, but the levels of nitrogen are low enough in the compressed air that the Oxygen pushes the nitrogen out… And that’s between about 25 and 10 feet of depth. So it’s a common practice, when you go to the surface, to stop at about 15 feet for 3 minutes to allow your lungs to push the remaining nitrogen out of your blood. If, instead, you rocket to the surface while you have nitrogen dissolved in your blood, the nitrogen forms bubbles in your blood, literally boiling and blocking blood flow to arteries and even your brain. This is known as being ‘bent’, or having ‘the bends’, and again, it can kill you. a) carry a computer that will constantly compute your nitrogen levels and warn you when to return to the surfaceb) ascend to the surface very slowly… more slowly than your bubblesc) stop for a 3 to 5 minute ‘safety stop’ at 15-20 feet depth… This allows your body to ‘offgass’ (a nifty way of saying exhale) the nitrogen out of your blood before returning to the surface. As you go deeper below the ocean’s surface, the more the pressure of the water above you presses down on you and compresses you… As a result, the deeper you go, the faster you sink. Scuba divers overcome this constantly changing ‘weight’ by putting little puffs of air into their BCD vests. This can become dangerous if you begin to head for the surface without letting this air back out. Just as air compresses as you go deeper, it expands as you ascend… If you ascend too rapidly, the air in your vest can inflate rapidly, causing you to ascend even faster, which creates a runaway cycle of faster ascension which creates even faster inflation. This can result in an unplanned rocket-trip to the surface, often resulting in the bends and exploded lungs. This happened to my girlfriend while we dove in Thailand, and although I had already thought through the scenario and quickly grabbed her and let the air out of her vest, she shot up quickly enough that, despite my stopping her before we got to the surface, we both received a moderate case of “the bends”. The solution to avoid this is quite simple: Before ascending, let air out of your BCD. Don’t wait to get to 15 feet to let the air out. With enormous fins on your feet, it is easy to ‘fin’ your way to the surface, even if you’re weighed down. But once you start rocketing to the surface, there are no ‘brakes’ you can apply to stop your ascent. Better to play it safe and ALWAYS let air out of your BCD before you ascend any significant distance. Scuba is a truly incredible sport, and by understanding the risks dangers, you can keep yourself safe and free to enjoy the vast and largely undiscovered underwater world around us. Very informative, and clearly written. Though I’ve never dived, I’ve always been intrigued. This article piques my interest and gives good, solid data to help me understand the challenges, requirements, and also the reasons to go ahead and learn. Thanks. this makes a lot of sense… thanks!